Right now, we’re in transition mode, having moved to another city (temporarily) and attempting to settle into another home. It’s a rented house, so we’re restricted with what we can do. However, we’re blessed and grateful to be able to have family to stay with in the interim and to support us in numerous ways. I’m having connectivity issues because our landline connection hasn’t come through. So my blogging activities have been restricted. But I’m not grumbling. The joy of reading always compensates. My constant companions down the years, books have seen me through a lot – both good times and bad. I’ve managed to read 10 books in the 15 days we’ve been here and am once again grateful for my Kindle that helps me to have so much reading material available without having to lug a big box of books around. 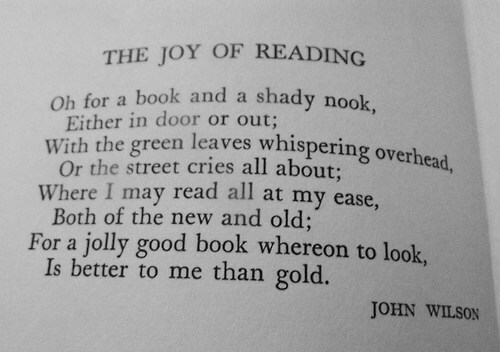 The Scottish poet, John Wilson, wrote this verse on the joy of reading. Do you enjoy reading? Are you teaching your children to be readers? Angela Artemis of Powered by Intuition is offering her book The Intuition Primer: Practical Lessons to Launch Your Intuition free on Amazon today. Go grab a copy. Vidya’s Sundays in My City post on the ancient Indian art form of Leather Puppetry. I’m keeping this post short. Do add your link to the linky below with a post your wrote today (June 15) and leave a comment. I find that books provide me with not just company but also solace and sometimes an escape route too. I was gifted my first book at age 3 and I still have it along with the many others I have bought or acquired in the last few decades. I’m glad Kindle was invented else I would have had to fashion furniture out of our books. I hope Hyderabad is treating you well and look forward to seeing you back on Write Tribe soon. Stay well and take care! Sorry you’re having internet issues, Corinne. Enjoy your time away. Always great to get caught up on one’s reading! I love it too, but somehow, being online leaves less time for it and there’s a huge backlog now. Kindles etc. were something I resisted until recently, when hubby gifted me with a small tablet. It certainly is easier than lugging books around but I miss the feel and rustle of the pages. I love this list of quotes. Perfect for a reader such as myself. So happy that I stumbled upon your blog. Thanks. now that you are in Hyderabad and its about reading and books here something I came across many moons back.. Nothing can compare to reading a good book, you create all the sounds, smells and pictures in your mind and nothing leaves you even when you’re finished. It’s so much more intimate than watching a movie. I’m amazed by how some books can totally consume you that you can’t stop thinking about them for days afterward. Glad to know you are almost settled and I really liked this post about reading . Lovely quotes making us think and feel glad that we are book lovers. Thanks to you I have also joined net galley and hope to enjoy even more on this blogging/writing journey. A perfect post for a bookworm like me. Books can be so therapeutic sometimes. It heals the soul. Hope you’ve settled in well Corinne! Hugs! When a child sees her parents reading , she too automatically picks up a book. She needn’t be taught. Hope you’ve settled down now and all is good with you. Love the quote by Kenko Yoshida. Thanks, Joe. How have you been? Okay, so I am praying that your landline connection comes through soon. BSNL or Airtel? On Saturday, I simply played hooky and freaked out sorting out all the digital books I’ve got and oh, the absolute joy. I gloated and gleefully got acquainted with my “stock” and laughed reminiscing over our conversations. Yes, I miss you. Hugs! And thank you for the mention. My pleasure, entirely! 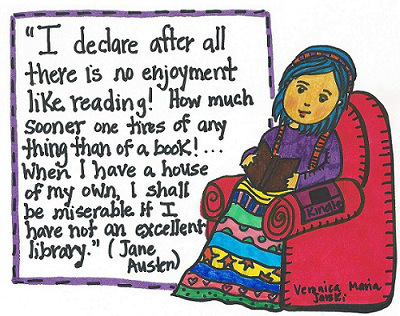 The Joy Of Reading – that says it all. What a joy and privilege to share the written word. Sorry you are having connectivity problems and looking forward to having you back full time! Truly a joy and a privilege, Carol. Thanks for your comment – looking forward to being back soon!